Great leadership is hard to find. Companies spend millions trying to fix their leadership issues by recruiting new leaders, hiring consultants to tell them how to restructure and a myriad of other ‘outside-in’ initiatives that fail to achieve the intended results. What if they’re approaching the leadership dilemma entirely the wrong way? Peter Shields has written a truly unique book. Peter describes the opportunity and challenges involved in what the leadership research and literature espouses. He has created a leadership novel with a rich constellation of complex characters, plots, themes and resolutions. All business is personal and it can be a profound journey of transformation. 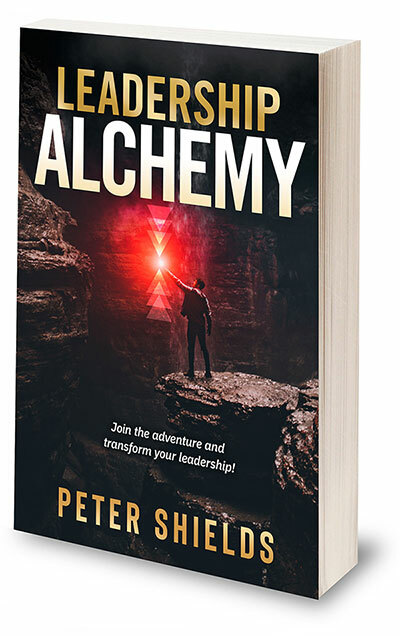 Corporate Alchemy artistically renders the transformative journey of business leadership into a powerful and very provocative leadership transformation read. Leadership Alchemy is a must read for anyone in leadership, adult development or the executive coaching industry. Leadership Alchemy presents a compelling vision and pathway to great leadership and comes at a time when humanity and the planet desperately need it. This is a book rich in wisdom and lessons skilfully woven into a storyline populated by engaging characters – ‘show not tell’ at its very finest. Peter throws down the leadership challenge and then leads us on the adventure – it’s clear that it’s not easy, it’s not quick and it’s not for the faint hearted but for those willing to take it, the rewards are immense. This is the guidebook I will carry on my adventure and I am immensely grateful for it. Peter Shields is one of Australia’s busiest and most experienced Executive Coaches and Leadership Consultants. He is an ICF Professional Certified Coach specialising in Transformational Executive Coaching. Peter’s been honing his skill and passion for merging self-awareness and leadership effectiveness since the year 2000. He is married with two boys (9 and 6) and lives south of Sydney surrounded by the Royal National Park and the South Coast beaches.